We’d love your help. Let us know what’s wrong with this preview of Saratoga by Michael Jan Friedman. To ask other readers questions about Saratoga, please sign up. This review has been hidden because it contains spoilers. To view it, click here. Though I think this did rise above being the Deep Space Nine version of "Reunion" it only peaked above just a touch - as it was pretty much the same thing but shorter and with an Odo and Rom side plot. I liked some of the new characters that were introduced in the story but they sometimes did get muddled in my head. Personally, I thought the culprit was going to be a Changeling because there were so many times where characters were surprised by people's entrances and it seemed to be going that w Though I think this did rise above being the Deep Space Nine version of "Reunion" it only peaked above just a touch - as it was pretty much the same thing but shorter and with an Odo and Rom side plot. I liked some of the new characters that were introduced in the story but they sometimes did get muddled in my head. Das war ein dermaßen schlechter Roman! ich verstehe nicht, wie der an den Lektoren vorbei gekommen ist... die Charaktere waren völlig anders als in der Serie. star fleet feuert nie den ersten Schuss ab -aber hier tun sie es, aus einer vermutung heraus, angegriffen zu werden-dabei haben sie vorher einen Notruf abgesetzt! leider ein ganz schlechtes, langweiliges, ätzendes buch! Jednoduchý prvoplánový příběh s chybami zkloubený s špatným překladem s chybami. Ve výsledku jsem byl rád, že je kniha tak krátká. Although the main story in the book focuses on the events of Sisko escorting his old crew mates to the launching of the new Saratoga I found the story of Odo and Quark a much more entertaining read. Let me first address the Sisko storyline. After the events at Wolf 359, where the Borg attacked the Federation with the aid of Captain Jean-luc Picard of the USS Enterprise, and where Sisko lost his wife in the Saratoga's destruction, the old crew is brought back together to witness the launch of the Although the main story in the book focuses on the events of Sisko escorting his old crew mates to the launching of the new Saratoga I found the story of Odo and Quark a much more entertaining read. Let me first address the Sisko storyline. After the events at Wolf 359, where the Borg attacked the Federation with the aid of Captain Jean-luc Picard of the USS Enterprise, and where Sisko lost his wife in the Saratoga's destruction, the old crew is brought back together to witness the launch of the new Saratoga. While in transit from DS9 to the shipyard at Mars, the Defiant is victim to acts of sabotage by an unknown perpetrator. While Sisko and the team investigate the events, the old crewmates and the DS9 crew bump heads until the villain is captured. Although some aspects of the storyline above are compelling and entertaining I found some of it to be a little bland and at times out of character for some of those people portrayed in the show. One scene where Dax and the counselor get into and argument on the bridge of the Defiant seemed very poorly written and was not even remotely reflective of the professionalism found on the bridge. I also was disappointed in how the Defiant was steered into a energy wave flying through space. The whole nexus/genesis wave is so over played it has become a crutch by many authors who can't imagine something better to come up with. The better storyline in the book follows Quarks need to get a new power source for Major Kira and the Bajoran people who risk massive flooding if the water pumps on the planet are not restored. The idea of Odo taking the shape of Quark in order to see the deal through after Quark gets sick is very good and entertaining. Watching the events around that storyline is great writing and reading, very fun indeed. The book is well written. The story is very good. The characters are true to nature, for the most part, and the dialogue and personalities are conveyed just as they are in the show. Captain Sisko’s wife was killed along with others when they were serving on the U. S. S. Saratoga during the titanic battle with the Borg at Wolf 359. Those painful memories are reawakened when the other survivors of the battle arrive to be taken to a ceremony where a new Saratoga is being launched. What should have been a routine journey aboard the Defiant turns potentially deadly when they inadvertently are captured in an energy nexus and the ship fails due to what is believed to be sabotage Captain Sisko’s wife was killed along with others when they were serving on the U. S. S. Saratoga during the titanic battle with the Borg at Wolf 359. Those painful memories are reawakened when the other survivors of the battle arrive to be taken to a ceremony where a new Saratoga is being launched. What should have been a routine journey aboard the Defiant turns potentially deadly when they inadvertently are captured in an energy nexus and the ship fails due to what is believed to be sabotage. Once again, the engineering team on the ship finds it necessary to create a solution to the failed engines before the ship is sucked into the nexus and destroyed. The problem is exacerbated by the reality that one of Sisko’s old shipmates and friends may be responsible. In true Star Trek fashion, solutions to all the problems are found and the ship returns to the station, Following a typical path of many Star Trek novels, there is a second and distinct plot track, where Quark is to negotiate the purchase of critical equipment for a city on Bajor. This is generally a distractor, for there is no tension or force to this track and is the primary reason why I give the book three stars. It's an efficiently A&B plotted story. The A storyline - remember in Emissary when Sisko was still on the Saratoga when the Borg attacked and we saw the crew running around trying to abandon ship? Now we finally get to meet some of that crew! With the new Saratoga about to be christened, several of the survivors arrive at Deep Space Nine to travel together on the Defiant to the Utopia Planitia Shipyards. Meanwhile in the B storyline, Kira needs a favor from Quark, but who will help when Quar It's an efficiently A&B plotted story. The A storyline - remember in Emissary when Sisko was still on the Saratoga when the Borg attacked and we saw the crew running around trying to abandon ship? Now we finally get to meet some of that crew! With the new Saratoga about to be christened, several of the survivors arrive at Deep Space Nine to travel together on the Defiant to the Utopia Planitia Shipyards. Meanwhile in the B storyline, Kira needs a favor from Quark, but who will help when Quark can't? I'm not sure what it is, but there is something lacking in this book. Part of the story becomes a mystery and plot wise it is satisfying. I really don't have any complaints about the book or the characterizations, but it seemed to lack a certain pizazz that would have earned it 4 stars. There's another Star Trek novel called "Reunion" by Michael Jan Friedman with a similar plot. In Reunion, Captain Jean-Luc Picard's old shipmates from the USS Stargazer arrive on board the USS Enterprise-D. Unexplained events and sabotage have former and current crew thrown together and all of the former crew have secrets of their own. In "Saratoga", Sisko's former and current crew are thrown together and the former crew have secrets of their own. Similar premise, but IMHO, the events of "Reunio There's another Star Trek novel called "Reunion" by Michael Jan Friedman with a similar plot. In Reunion, Captain Jean-Luc Picard's old shipmates from the USS Stargazer arrive on board the USS Enterprise-D. Unexplained events and sabotage have former and current crew thrown together and all of the former crew have secrets of their own. 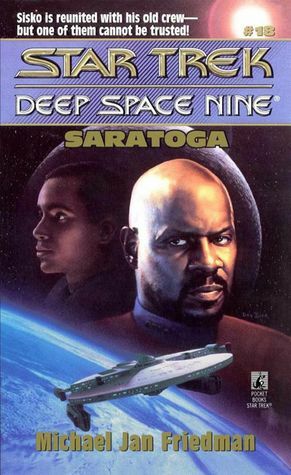 In "Saratoga", Sisko's former and current crew are thrown together and the former crew have secrets of their own. Similar premise, but IMHO, the events of "Reunion" are far more compelling and the secrets much more deadly. Another okay read. Sisko reunites with former crewmates from the Saratoga, and en route to a Starfleet ceremony one of them sabotages the Defiant, putting the rest of the people on board in mortal danger. Meanwhile back on DS9, Odo gets roped into impersonating Quark to do a favour for Kira... Entertaining enough, but nothing memorable. A decent book, very much like a TV episode. Sisko's old crew get together to go to the renaming of a new Saratoga. Meanwhile Odo is helping out Kira. The characterisations are good and you can see the action. Very good! Nice backstory for Sisko, with a well-done mystery and wonderfully fleshed-out characters. Reads precisely like a lost episode. Perhaps a few too many new characters, but great pacing and overall design. Another one I'm fairly certain I read but can't remember the details. Michael Jan Friedman is an author of more than seventy books of fiction and nonfiction, half of which are in the Star Trek universe. Eleven of his titles have appeared on the New York Times Best Seller list. Friedman has also written for network and cable television and radio, and scripted nearly 200 comic books, including his original DC superhero series, the Darkstars.